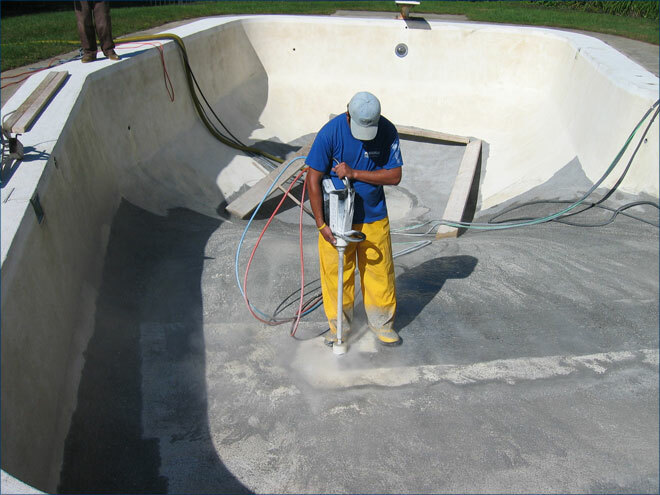 Puraqua Pools offers Water Blasting Service for interior swimming pool surface preperation. 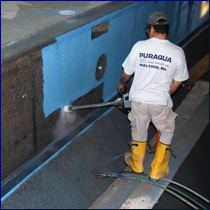 Puraqua's water blasting division services the greater Boston, Massachusetts area as well as most of east coast. 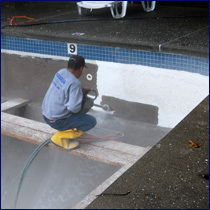 The conventional method of sandblasting to remove paint or flaking plastering from a pools surface is an application of the past. 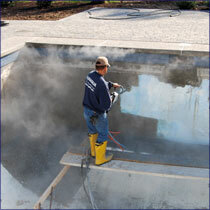 Sandblasting converts the existing surface into fine dust particles that travel throughout the air that we breathe and eventually covers your backyard creating a major cleanup. Our unsurpassed, state-of-the-art Ultra High Pressure WATER BLASTING for interior surface preparation is the most thorough method to ensure a good bondable surface . Using water up to 35,000 psi, the jets shoot a constant flow that removes any inferior marcite, paint or flaking concrete. (35,000 psi of hydraulic water pressure vs. 150 psi sand air pressure.